This blog was originally posted on Platform Magazine. Read it here. Out-groups and in-groups are part of everyday public relations and while the in-group is usually the easier of the two to work with, both are extremely valuable to the success of a company. In order to understand the value of the out-group, we must first discuss what an out-group is. Out-group members are usually not interested in pursuing the same goals as the in-group for multiple reasons. Sometimes they disagree with the goals of the in-group and sometimes it’s because they feel unaccepted by the in-group. Whatever their reasoning may be, trying to include these out-group members can be one of the most challenging tasks a leader faces. We have all been a part of the out-group at least once in our lives so it is important for us to remember what it feels like to effectively include the out-group members on each of our teams. High-quality relationships between a leader and their followers result in higher job satisfaction and an increase in job productivity. These relationships usually form quite easily between a leader and in-group members but the real challenge is trying to develop these relationships with out-group members. Here are some steps all leaders can take to create high-quality relationships with out-group members. Be intentional in listening to out-group members. According to Benedictine University, it is not only important to listen to what an out-group member is saying but to also listen for the underlying meaning behind what they’re saying. 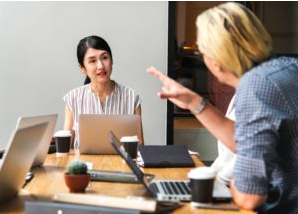 Leaders should exercise active listening by pushing their own biases aside, providing appropriate feedback and using nonverbal cues to show the out-group member that they are engaged in the conversation. Once you listen to the other person’s point of view, validate that view by acknowledging it. By recognizing them and showing empathy, they feel understood and supported. In order to find out what unique talents out-group members bring to the table, leaders need to pay close attention to the work and ideas of the out-group members. Whenever they do something that adds value to the team, praise them and recognize their strengths. Empower out-group members to act. The final step in including out-group members is empowering them to act. According to Northouse, this is one of the most difficult steps to take because it means allowing out-group members to become more independent and hold more of the power over their tasks. Once you understand their points of view and recognize their strengths, encourage them to use those strengths to accelerate the goals of the team. By empowering them to act, out-group members feel included and valued. Through the strategies mentioned above, out-group members will become more effective team members and a leader will become a more effective team leader. Not only can this have a positive impact on your firm or agency but also on your client. Out-group members bring in new and unique perspectives and talents that might be missed by the in-group. By acknowledging these unique perspectives, client teams can use them to improve a client’s campaign and messaging. Anna Jones is a senior at The University of Alabama studying public relations and communication studies. She serves as the VP of publications for The University of Alabama PRSSA Chapter and as a senior media coordinator for her Chapter’s student-run firm, Capstone Agency.